Today is my birthday and I’m writing this post in advance so I’m not sure what my day has in store for me, but whatever it is I will be sure to tell you. 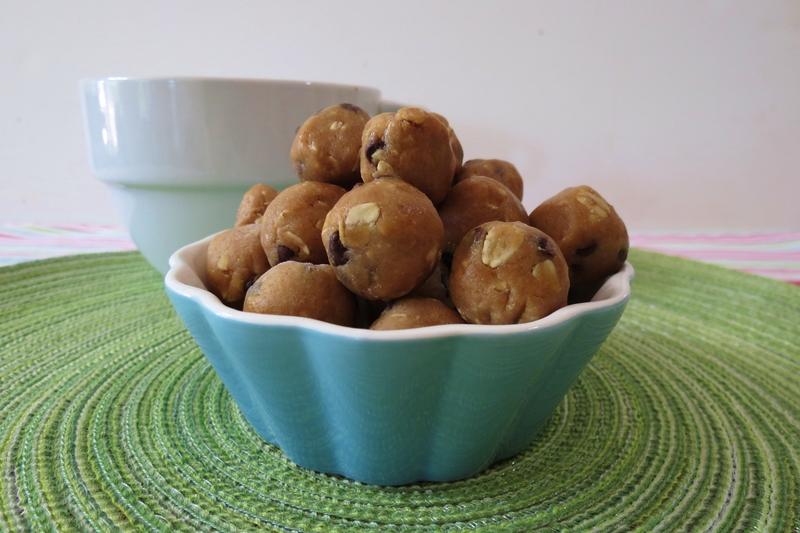 For my birthday celebration I decided to make these quick and easy Peanut Butter Chocolate Chip Pretzel Balls. Yah, most people would make cake, but it’s my birthday and I didn’t feel like baking myself a cake, so I made balls instead! I thought I would share with you somethings that I have learned at my old age before I got to today’s recipe. 1. Exercise is healthy! I never exercised until my late 30’s and being at the age I am right now I feel the best about myself then I ever had. I no longer have asthma, my cholesterol is super duper low and I weigh less now then I did in highschool. 2. Looks aren’t everything – I was always paranoid that I had to have makeup on, that I had to dress in the best clothes, trying to keep up with the Jones. Really, no one really cares, as long as you’re not smelly and you don’t wear raggedy clothes. 3. Laying in the Sun is bad – I spent countless hours laying in the sun getting burned, trying to get the darkest tan. I have better things to do now besides laying there and sweating. Plus you can get skin cancer and wrinkly skin. Who wants that? Not me! It’s a shame that it took a few biopsy’s to figure that one out. 5. Family – I never really knew what love was until I met my Husband and his two kids. Everything was always about me, but now I know how important family is. I miss my Mom, Step-dad and sisters too. 6. Love Loss – I never really experienced a close death in my family or with friends, until I lost my dog Doodles. That was the most awful thing I could have gone through. I realized how important my dog is to me, that she wasn’t just a dog but she was family. I still cry when I think of her and I don’t really talk about her much because it still hurts and it has been almost three years since she left this earth. I do however celebrate her life, and I am proud because she showed me how to handle a great loss and she taught me not to take family for granted. That I need to enjoy every moment because you never know when it maybe the last. 8. Owning a home – I was always content just renting an apartment, but until I got my home I realized how wonderful it is. I get to do what I want and not have to worry about landlords, noise or decorating. The only one I have to worry about is my Husband. So I learned to save money and to be a responsible adult. 9. Eating Healthy – I never would have thought I would eat black beans, sweet potatoes, stevia and limit my sugar in take. But you know what? I found that you can take everyday food and make it healthier. I don’t miss chicken wings, fatty pizza, ice cream sundaes or greasy burgers. I found I can still have these things but have them more healthier. I wish I realized this years ago. If you told me when I was 20 I would be eating this way now, I would never of believed you! 10. Loving what you do – You go through life doing what is expected of you, you work at a crappy job, you do things for others and life is just life. It took me a bazillion jobs to find the one I love. I work with great people, I love most of my clients and I am proud of what I do. For my evening job of blogging, I love it!! It’s a hobby that I didn’t realize would become a big part of who I am. I enjoy creating recipes, sharing stores and reading your comments. I have learned so much from blogging and whats even better is that I am now getting support from my friends and family. Before, most thought this was weird and a waste of time, but now they see how happy I am. 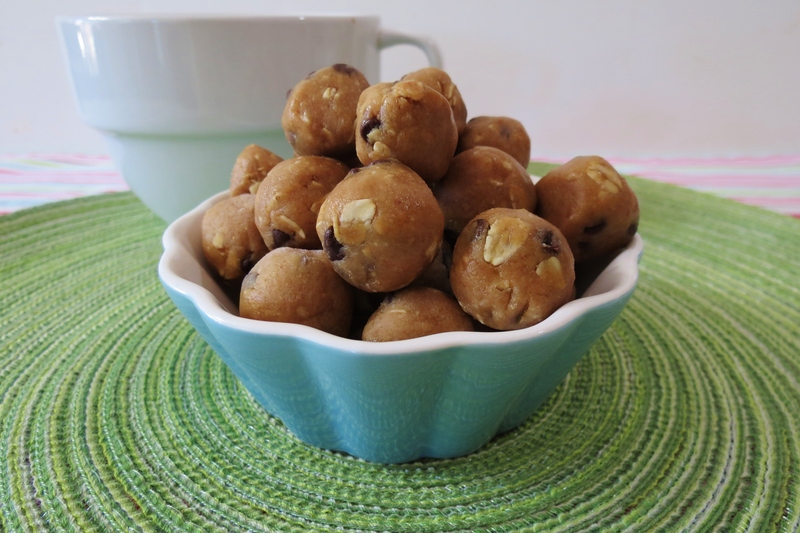 Now for my Peanut Butter Chocolate Chip Pretzel Balls! That is a mouth full, and so are these little bites of heaven. I make these little guys quite often. 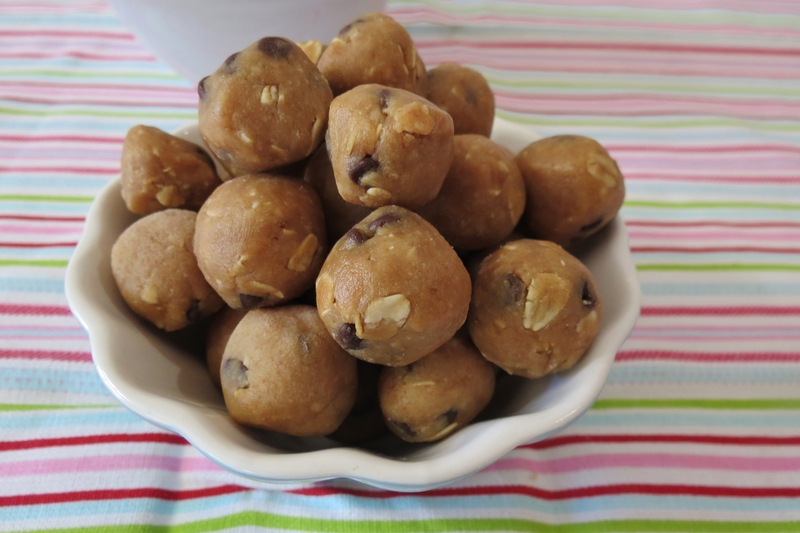 They are sweet, soft, and loaded with Peanut Butter flavor. Yum!! 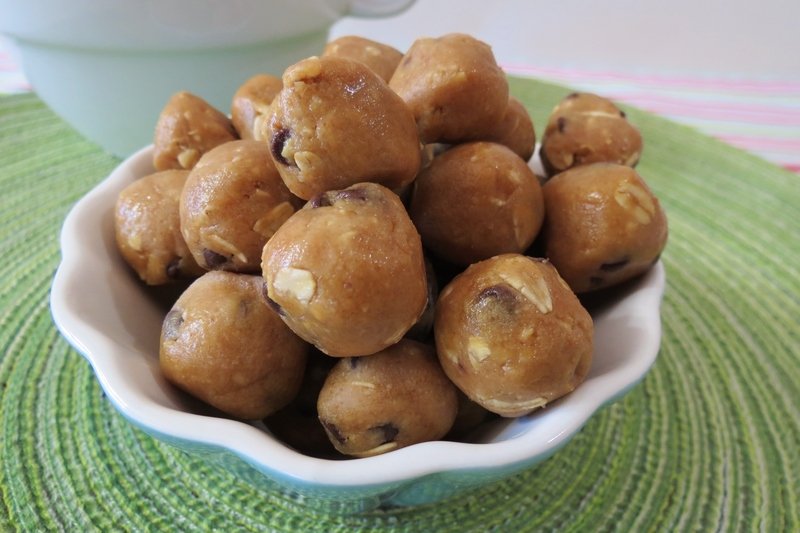 I decided to use my Honey Roasted Pretzel Peanut Butter to make these balls. The Peanut Butter was perfect, sweet, salty with little bites of pretzels. 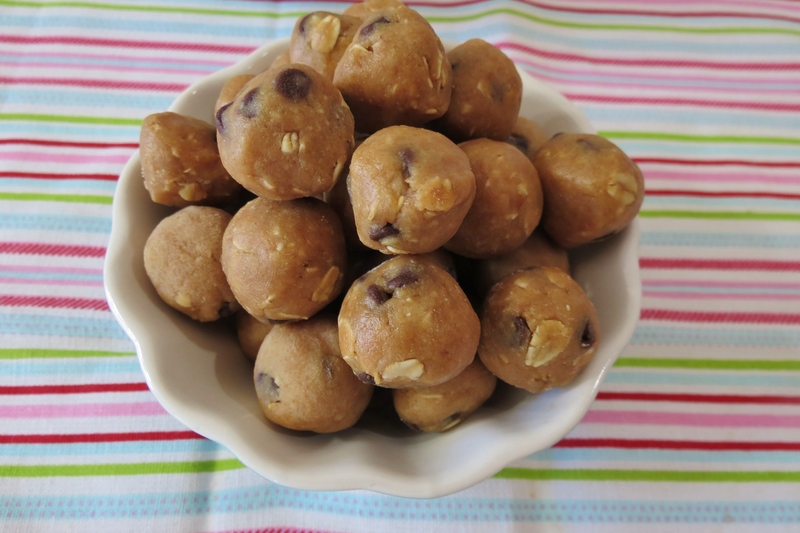 I added some oat flour, rolled oats, vanilla extract, maple syrup and mini chocolate chips to create these PB balls. I like to place them in the freezer and pop them into my mouth when I want a snack. I got the idea for these cookies from Averie Loves to Cook. I didn’t realize when I made these cookies that I must have read this recipe somewhere else, and I am not one to steal a recipe, so I must give credit where credit is due. Thanks Averie for all of your delicious recipes!!! If you don’t have Honey Roasted Pretzel Peanut Butter you can always use regular Peanut Butter, they will taste just as good, trust me. 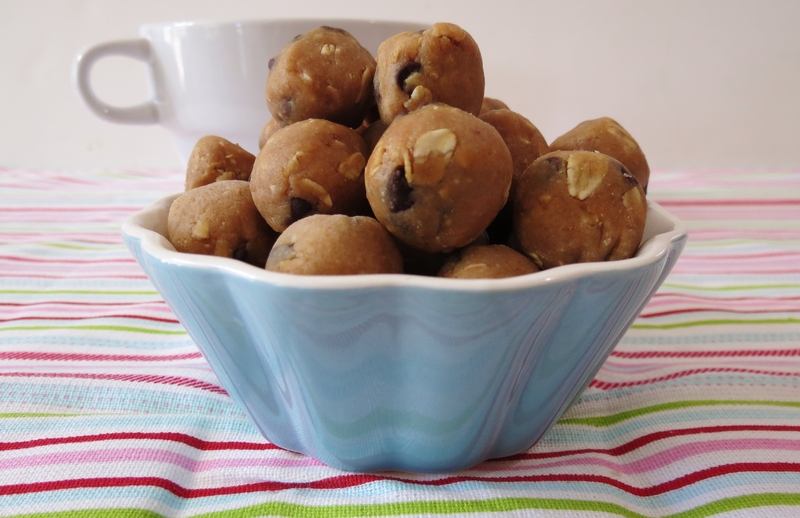 Also, trust me on this one, if you’re a Peanut Butter fan you will LOVE these Peanut Butter Balls. 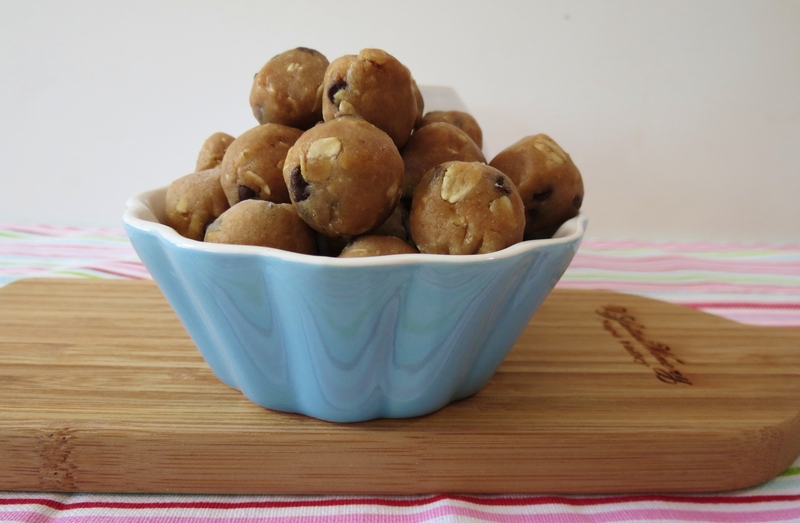 A sweet and salty peanut butter cookie dough no bake cookie. Place all ingredients in a bowl. Mix with a spoon until incorporated. Roll into little balls. Place the cookies on parchment paper, place in a freezer to harden. Once harden place PB balls in a ziplock freezer bag. Well my Friends I am off. Have a wonderful weekend! Happy Birthday, Jennifer!! Wishing you the best year yet! Thank you Stephanie! I think this will be a great year! Happy birthday! 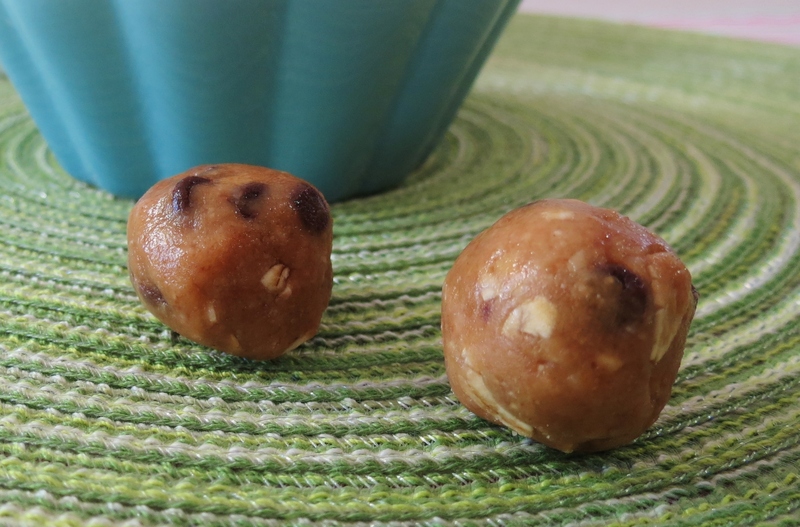 The one time I made balls for my site I would up calling them bites. Everything with balls in the title makes me giggle. I’m that mature. But I must say you’re balls look delicious! Thanks Averie!! And thank you for all of your fabulous recipes!! First off, happy birthday! These sound delish but where is the pretzel part in them? Am I overlooking that? Thank you! I made pretzel peanut butter, but I bet if you take regular peanut butter and crumble pretzels in it, you’ll get the same PB balls! Happy Birthday from one birthday girl to another! My birthday is tomorrow…must be why I enjoy your posts soooo much! I always make Butterscotch Krispies for my birthday treat but I’m going to make your birthday treat very soon as PB is one of my favorite foods and these look YUMMY! Have a great day! Happy Birthday Jody!!! Butterscotch Krispies sound delish!!! Mmmmmm those look delicious!! AND HAPPY HAPPY BIRTHDAY!!!! Happy Birthday!!!! These balls look so good, and I love the list of things you learned over the years. Enjoy your very special day! HAPPY BIRTHDAY!!! ps. I love your title. balls hahahaha. Happy Birthday!!! I was looking for something with peanut butter and here it is! Thanks, I’ll be making these tonight. Have a great birthday weekend! Thanks Jan! If you make them, let me know what you think!! Happy Birthday to a brilliant chef! Ahhh thank you Anna, you are so sweet!!! Jennifer – Happy Birthday and enjoy your day!! Thank you Nancy, I did enjoy my day, wish it didn’t end! Thanks Erin! You know me and peanut butter! Time to make another batch! I bought my oat flour from Bob Mills, which you can get at a local grocery store or you can take old fashion oats and grind it in your food processor to make oat flour. That’s what I normally do when I’m out of Oat flour. Thanks Kristi!! Yup, loving exercise for more reasons then one! I didn’t get a cake, but Little Jenny treated me to a piece of Cappuccino Cake from our local bakery, it was delish!! Happy Birthday! Visiting from Sweet Tooth Friday. These look delicious. Thanks Julie!! Have a great week! Happy Birthday! I made Oreo Balls a few weeks ago that were amazing but definitely not 29 cal per ball. Thanks for the recipe I can’t wait to make these!! Ohhhh Oreo balls! Now that sounds yummy!! Did you post the recipe on your blog? Yum! I tried to leave a comment on your post, but it didn’t stick! Your Oreo Balls look fantastic! I have to make them! !